But I'm a pretty pro gamer < don't get the stereotypical gamer/nerd image of me though, cause I'm nothing like that...But I do love my games! What's accomodation internet connection like around the Kent Unis? If anyone also is into gaming that'd be a great insight, constant disconnects etc? Also; if you're on Uni Accomodation, could you potentially upgrade your connection yourself by paying more? I knew someone in my first year who used to game professionally and would have to go to tournaments and stuff - I think he quit doing all that when he came to uni but he did use it as his excuse to have his car kept on campus with a parking space permit. Anyway back on topic - internet connection is fine. It's better than fine. It's incredible. Unless they decide to take it down for maintenance but they usually e-mail out before that happens and it's not very often. I would online game all the time in first year and never had any issues with speed. I believe they're letting people connect up their XBox Live and PS3 network things to the uni network as well now. I sometimes play a few games, no issues at all. The study bedroom network is very good, I haven't come across any blocked ports for games either. You will generally get speeds 25-30Mbps down, upload is throttled right down to about 1Mbps but that really isn't a huge issue. Not for gaming anyway. Pings hover around 5ms to most UK servers. Flash video is throttled on the SBS network, however I haven't personally noticed it being slow or constantly buffering. Not that you can really do a lot on campus PCs/wireless as it is more restricted. Yes game consoles are allowed on the network, however applications must be approved and then the console manually registered. There are limited registrations available. Probably best to get in quick when you arrive if you want a console registered, otherwise you may be put on a waiting list. Ultimately, I don't think you will have any problems with the bedroom Internet connection. 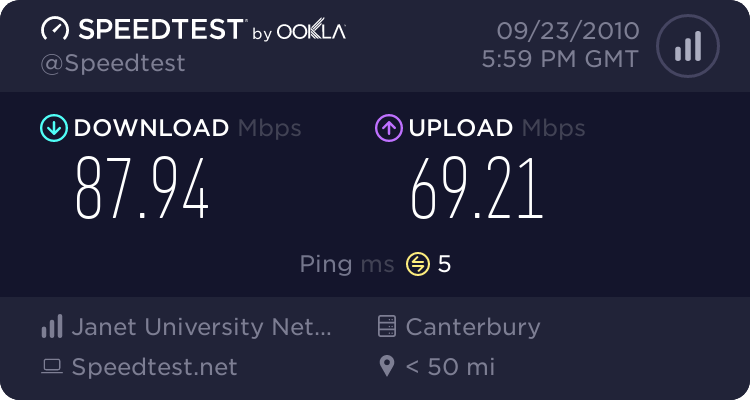 The problem is when you move off campus, I've heard Canterbury's internet connections aren't too great. Yeah I imagine they are still playable, just they aren't particularly fast in comparison to Kent uni and other areas of the country. For example, Ashford which isn't even that far away has had speeds of 50mbps+ for some time. Well obviously the university can afford an industrial power connection speed but I can guarantee that I've never had a lag issue yet on my broadband off campus. Though upload/download speeds obviously aren't going to be as amazing as on campus but for the purpose of gaming then on or off campus you'll be fine. OP in answer to your question, I agree with all of the above; the internet connection you get in your "study bedroom" really is great! Especially as it's not via the wireless network, you use an ethernet cable. Hey man I'm in parkwood houses and the internet is great. I've downloaded at about 11mb/s before. Also, although I only play the one game every now and then on my laptop, my ping varies literally from 1 - 10. Admins of servers would constantly accuse me of ping masking when I went below 5. In answer to your question you have nothing to worry about! As said its on a campus student PC which is a different network to Study Bedroom Service, I think it was in Cornwallis. You probably won't get far above 30mbps in study bedrooms, but that is more than enough! You can probably get similar speeds in the library. Heh good luck. I can only see the library being extremely busy over this term, it was surprisingly busy during the vacation. Haha, good plan. I have 8 exams ahead of me, I can't wait until the 15th of June! I graduated from UKC last year but while i was there i can say that their oncampus internet connection was and will probably be one of the best you will get in all of the UK uni's - this is because they host one of the main backbones in the UK (see: http://en.wikipedia.org/wiki/Internet_backbone) - An example of this is i play abit of CS and my ping's on UK servers would usually never exceed 8. and go as low as 2-3. How do I beat this girl at video games? help with python code please!!!! Do the majority of girls really not play video games much? Gamers at Leicester University anyone?